Studying the development of children in their everyday lives from a personal, institutional, and societal perspective is at the heart of Mariane Hedegaard’s seminal work. This chapter draws upon research undertaken together (Hedegaard and Fleer in Play, leaning, and children’s development: everyday life in families and transition to school. 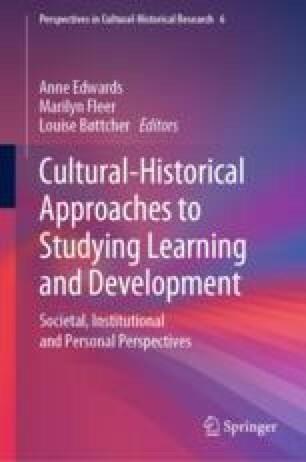 Cambridge University Press, New York, 2013) and expands the original analysis through using Hedegaard’s (Learning and child development: a cultural–historical study. Aarhus University Press, Aarhus, 2002) concept of motives and demands in the context of Vygotsky’s concept of the social situation of development to study how one Australian family created the conditions for play and development. Through following the perspective of the youngest child in her family over 12 months, it was possible to determine how the family works with a collective social situation of development . Specifically, the chapter shows how the family was in tune with the differing social situations of development of each of the four children, and this attunement created the developmental conditions for learning how to collectively play, as well as how to engage in higher forms of play, such as games with rules. The outcomes of the analysis foreground the conceptual power of Hedegaard’s model of child development and her analytical frames when researching the everyday lives of children in families.